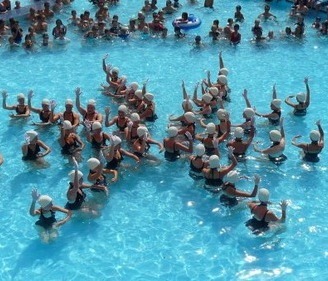 Synchronised swimming or Aquatic dance is often described as ‘water ballet’, because of the dance-like movements swimmers make to music, and its theatrical character. Even though it looks like one of the easier Olympic disciplines, synchronised swimming actually calls for strength, endurance, flexibility, grace, artistry, and special endurance breathing techniques. Synchronized swimming or Aquatic dance (often abbreviated to synchro) was not Williams' Olympic goal or sport of interest. She had hoped to compete as a swimmer in the 1940 Olympics, but they were cancelled because of World War II. Her aquatic talents were put to immediate use in Hollywood where her blockbuster films popularized the sport. At the 1952 Olympic Games, the same year Million Dollar Mermaid hit theaters, synchronized swimming debuted. In 1984 it became an official Olympic sport. From its showcase in 1952 to the present, Olympic synchronized swimming has been a female- dominated sport. Male synchronized swimmers, unfortunately, are barred from competing in the Olympics. But last month before the Games began, Out To Swim, Britain's male synchro team, wrote a letter to the International Olympic Committee and FINA, the international federation governing body of swimming, contesting that males deserve to compete in synchronized swimming, and their discriminatory rules need to be changed in time for the 2016 games in Rio de Janeiro. First known as "water ballet," synchronized swimming was thought of as a delicate, feminine and frivolous sport seen primarily as part of Hollywood musicals and Las Vegas acts that no real strong men would deign to engage in. Mocking the notion that a male would spend time pursuing the sport, Shearer, in the skit, portrays a man giving up his job in pursuit of being the first male synchronized swimmer in the Olympics. Shearer and Short in swim caps, lifejackets, and nose plugs do a silly interpretive dance in the shallow end of the pool helped foster a damaging image of the sport as purely entertainment rather than athleticism. Men have never done synchronized swimming in a sanctioned competition in this country. Officially, it's got like a zero acceptance rate... Men's synchro isn't even in the '88 Olympics yet," acknowledges one character. Synchronized swimming is a combo of swimming, dance and gymnastics. It's performed in deep water and accompanied by music requiring core strength, stamina, flexibility, breath control, and coordination, to name a few. The sport consists of several competitive formats: solo, duo, trio and team routines. Training can be easily six days a week from six to seven hours a day in the pool and then two to three hours out of it.